There is a lot of interest among faculty, students and our Dean’s Advisory Board members in the post-graduation experiences of our Integrated Business (IB) majors. It’s our newest major and is designed to produce graduates who can integrate across business functions. We’ve only graduated 26 students so far: 5 last summer and 21 more in the fall. It’s not a lot of data, but Chris Leo used LinkedIn to track the current employment of those 26 graduates and found information for 19 of them. That means at least 73 percent of our IB grads are currently employed although in at least one instance we know it’s a job they had while in the program. Conversely, we know that at least 3 students got their current job from an IB internship while at UCF. Collectively, the 19 students have a wide array of jobs. Four IB students work in marketing-related roles: Social Media Analyst at The Sports Quotient; Marketing Coordinator at John Wiley and Sons; Market Research Interviewer at Integrated Insight Inc. and Marketing and Research Associate at Coldwell Banker Commercial. Three IB grads have recruiting jobs at Alligent Healthcare, BlueWave Resource Partners, and TekPartners, respectively, while another is an Industry Development Professional at Pontoon Solutions– a staffing firm. Three other IB grads hold analyst positions: Revenue Performance Management Analyst at Global Convergence, Business Analyst at Masseys Services and Senior Purchasing Analyst at Publix Super Markets. Two grads are in project coordinator roles, (Rock Em Apparel and SON Technology) while two others are employed in customer service jobs (Enterprise and OnlinePartyDesign) and another pair in operations positions (Amazon and Apple). The list is rounded out with a Solution Developer at Deloitte Consulting and a Staff Accountant at RLF Architecture and Planning. Obviously 26 graduates isn’t a lot to go on, but I think the diversity of jobs held by our IB graduates speaks to the robustness of the major in providing general skill sets that can be employed in a wide variety of functions and settings. In a world where jobs and job titles come and go at an alarming pace, the ability to adapt, integrate and add value across functions is a great way to achieve employment security. It’s one of the ideas driving the development of the IB major. Keep it up IB faculty, I think you’re all on to something here. When you brand an initiative with a date, you eventually get a dated brand. In fairness to Dean Huseman, I’m sure he didn’t expect the curriculum he pioneered or the monument he commissioned to last this long. If there’s an alum who is interested in preserving it in their yard, den, etc., give us a call. As coincidence would have it, we are removing the last physical vestiges of this by-gone era at a time when we are also imagining the future of the College. We have challenged ourselves to think about what business education should like in the coming decades and how we can use this exercise to develop and act on a plan that will make us first-movers in the marketplace. It is not exactly clear yet what that future will look like, but competency-based curricula, career readiness for students and five-year programs culminating in master’s degrees are receiving a great deal of attention. Ultimately, we want to do for business education what Elon Musk is doing for cars. Hey, wouldn’t a brand new Tesla be the perfect thing to replace that BE 2000 monument under the steps of BA-1? Maybe when people do something really great in the college, we could let them toot the horn. We had a DeLorean for the Hall of Fame a few years back…. Tiffany, can you get me one of those? Near the end of last semester, a reader asked if I would post information about how many students got into each major based on their performance in the Fall semester. I commented at that time, that the data wasn’t ready yet, but that I would as soon as I had final numbers. The table below shows the number of students who got into the major of their first choice at the end of Fall 2016. This means they completed the primary core that semester and when they did, it qualified them to move from their designated “pre-major” to that same “major”. What the data below doesn’t show (we still need to compile this) is the number who decided to enroll in a different major after their performance last fall. We estimate that this about an additional 50 students. We admitted more than twice as many students into a major for this Spring 2017 (698) than we did last year at this time (312) when the system was brand new. In fact, we are nearing what we would expect to be a steady-state number for a Fall or Spring semester in-take into the majors, which is about 800. Note also that the relative order of admissions into the majors has remained the same. Finance is the most common followed by Integrated Business (IB) and then Accounting. Economics and Real Estate tend to have much more modest numbers. It’s a Little Messy in BA-1. While you were gone, we were busy tearing up BA-1. Well, not us exactly, the contractors. The goal is to give all of us more engaging common spaces, places we will want to sit down with each other, have conversations, build lasting connections and invent our futures. If you don’t think space matters, consider The Exchange’s role in changing the culture of the College. Today, its hard to imagine what we did without that space for so long. 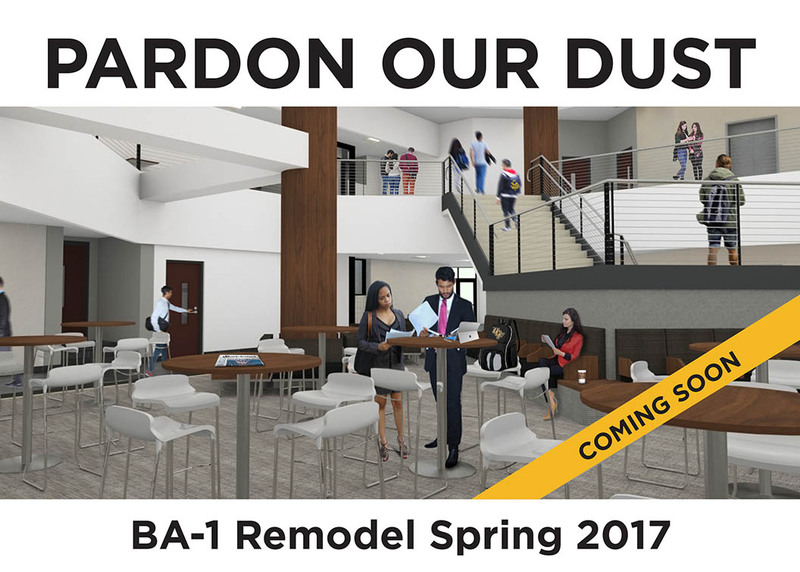 We are looking for the same type of culture impact with our refurbishing of the common spaces on the first two floors of BA-1. Eventually (some time in March or early April), the upgrade will look like this. A massive improvement, right? Yep, its a little Spartan. Don’t panic. We are still open for business. All of the classrooms are just like you left them and are clearly marked. Most of the work that needs to be done will be done at night, but the main internal stairways are closed. You will have to use the stairwells in the corners of the building and we have those clearly marked as well. Furniture is also pretty sparse, not a lot of places to sit in the common areas right now. Feel free to check in often and before you know it, we’ll have new common areas that will make you want to spend more time in BA-1. Like most people, I got a few surprises for Christmas. My wife, knowing my love for biographies of interesting people, got me Tim Farriss’ new book Tools of Titans. It condenses the tips he’s learned from many of the high performers he has interviewed over the years. Wow, academics everywhere are probably forming rebuttals to that observation before they finish reading that quote, but it’s a damn provocative insight… Take more risks and your mind will adjust to the notion you are a risk-taker. Act like the “Tesla of Business Schools” and your mind will eventually come around to the idea. Try to reason it out first and your head will come up with a million reasons why it’s a bad idea because it risks your short-term survival. Short-term threats is what evolution taught us our brains should focus on to ensure survival. But most of us don’t live in the wild anymore and long term thinking tends to lead to prosperity, not a focus on short-term risks and benefits in the modern world. So if you have a sense of a change you’d like to make in 2017, start acting that way now. Your brain can catch up later.